Enjoy the feeling of living in the country but only a few short minutes to Charles Town Center and all amenities. Additional Features and Amenities This beautiful 4 bedroom, 2.5 bathroom Colonial home in Sentry Woods has so much charm and curb appeal! Relax on the front porch and chat with your neighbors and take in the wooded view. 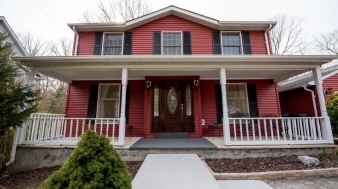 Inside, you will appreciate the upgraded hardwood floors throughout the main level. The front living room has tons of natural light and is attached to the kitchen. You will love the open floor plan designed for today's casual living. This kitchen was designed with the chef in mind and offers plenty of countertop prep space plus loads of wooden cabinets to store all your kitchen essentials. Recessed lighting really brightens the kitchen as well as the large windows. Enjoy the wooded view of your backyard from the window over the sink. Off the kitchen is the dining room and the family room. Perfect for entertaining your closest friends and family!